Home » Case News » GBDH obtains final approval of $113 million with City of Portland to build thousands of accessible curb ramps throughout its pedestrian right of way. GBDH obtains final approval of $113 million with City of Portland to build thousands of accessible curb ramps throughout its pedestrian right of way. GBDH, along with co-counsel Civil Rights Education and Enforcement Center (CREEC) and Portland Civil Rights Office, obtained a final approval of a $113 million settlement to improve the accessibility of Portland’s pedestrian right of way. 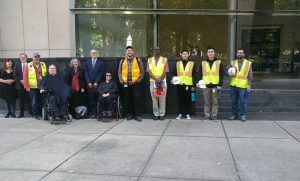 Under the settlement in Hines v. City of Portland the City is committing to install more than 18,000 accessible curb ramps throughout Portland over the next twelve years. In addition to installing thousands of curb ramps, Portland also promised to improve the way it responds to people with disabilities who report bad or missing curb ramps. More details about the settlement can be found in the following press release, and article. More details about the settlement can be found by reading the Final Judgment and Order Approving Consent Decree. Photo of Plaintiffs and City Representatives posing in front of federal court after final approval hearing.